When Whereabouts Holidays invited me to go out and try their hiking and biking trips in Romania, I was intrigued. Romania is a country I knew almost nothing about, apart from the fact that it is home to the legendary Count Dracula of course. A whole new country to explore and discover – what could be better? I flew into Bucharest, the capital, where I had a morning to roam around before I caught a train to Zarnesti, a small town at the foot of the Bucegi mountains, where I was to start off my trekking. My whirlwind trip round Bucharest showed me a city with magnificent state buildings and glorious parks, with an edgy, arty side typified by the street art and the skater boys who whizz past you on the pavements. It can be a bit intimidating arriving in a new country on your own where you don’t know the language and have no idea how everything works, but it was actually incredibly easy. I was met at the train station in Bucharest by the lovely Whereabouts representative, Raluca Teodor, who treated me to lunch, and took me through the whole itinerary. She had even brought along the kind of bike I would be riding later in the week to show me. That meeting set the tone of the whole trip - it all ran like clockwork. The maps and walking/biking instructions were easy to follow, taxis for transfers turned up ahead of time, and the pensiones (B&Bs) and lunch stops were all waiting for me to arrive. It meant all I had to do was walk or ride – just the way I like it! The first day dawned bright and sunny and after I had wolfed down large helpings of ham, cheese and home-made bread and jam, I set off for the forested slopes leading to Magura. The route took me out through the town, alongside a sparkling river and then into the woods and the start of the climbing. The shadowy canopy was a relief after the heat of the sun and walking on the fallen beach leaves and pine needles was soft on the legs. Up, up, up for three hours or so until I heard the tinkling of cow bells and saw a bright, open space out of the forest ahead. As I emerged, I was met by two giant dogs who were guarding their sheep and cows in the pastureland. They looked at me curiously but let me go my own way when it was clear I had no designs on their flock. Back into the forest and the rain started. Summer in the mountains, always means some rain, and the showers generally lasted around half an hour. Walking in the woods in the rain is a magical experience, and I was quite sad when it stopped. Lunch was sausages, cabbage and cake at a cabana with views down over the valley. The last part of the day was a long descent and then a brief up to the village of Magura where I was spending the night. I arrived around 4pm at the picturesque wooden traditional house I was staying in and was welcomed with a fresh tea made with garden herbs. Starting off in Magura was like going back in time. The men were cutting hay for the animals by hand using scythes and then constructing perfect conical haystacks. The animals all gleamed with health as they feasted on the lush green grass of the meadows and the only sound I could hear was the sound of their bells. A push up to a saddle gave on to views over two valleys and the range of mountains beyond. Wildflowers carpeted the open meadows in blue and white and pink. Today was a packed lunch day and I stopped in a prime viewpoint to eat my sandwiches and peach. I was joined by Annalise and Jen from Denmark who were also on the trip and we exchanged notes on the day. Travelling alone is never lonely when you do an active holiday as you always meet like-minded people. In fact, it is one of the great pleasures of doing these kinds of adventures. Inevitably, the rain started but instead of following my instructions and taking an easier path down the mountain, I decided to risk the harder path. I regretted that decision within five minutes as I found myself sliding uncontrollably down a steep, muddy slope on my bottom, desperately grabbing at roots and branches to try and stop myself. A big bruise on my backside and lesson learnt – listen to the experts! That night was spent in Bran and so before I went off to my pensione, I detoured to visit the castle, Dracula’s castle. Dracula is a blessing and a curse for Romanians. On the one hand who wants to be associated with an entirely fictitious blood sucker – on the other hand he does draw in the tourists. 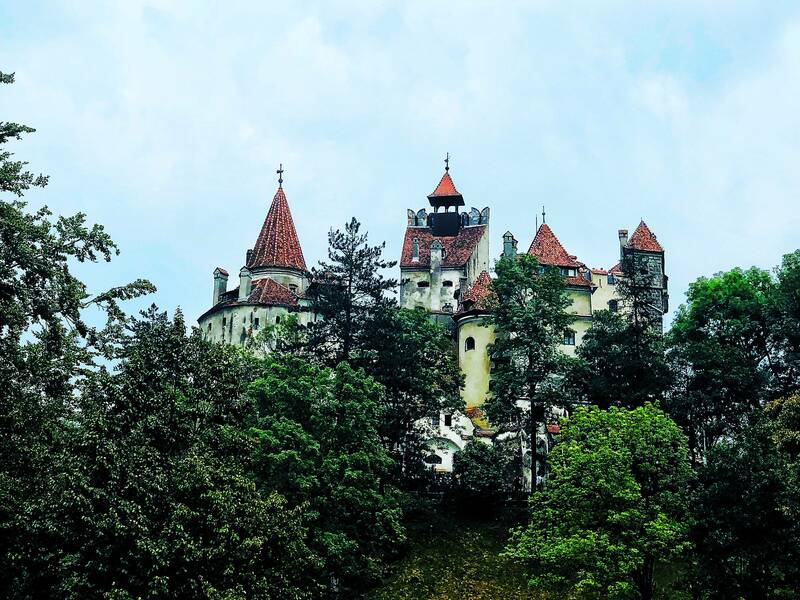 Bran castle itself is very, very popular as a tourist attraction so be prepared to be crammed in and funnelled through in a stream of hundreds of good-natured fellow thrill seekers. A big consolation for me was the fantastic hot chocolate and cake at the end in the restaurant below the castle which Jen and Annalise treated me to…. People are very nice to you when you travel alone. I haven’t done any proper cycling for ages so it was a real treat to get back on the bike. Even better, when I checked out my route for the day it was around 50km with more descent than ascent. Starting off out of Bran, there was a bit of climbing but the pay off was several kilometres of slight downhill where I could pedal and then coast. The route wound through fields and forests and pretty little villages where the extra height given to me by the bike meant I could peer over people’s walls and into their gardens. 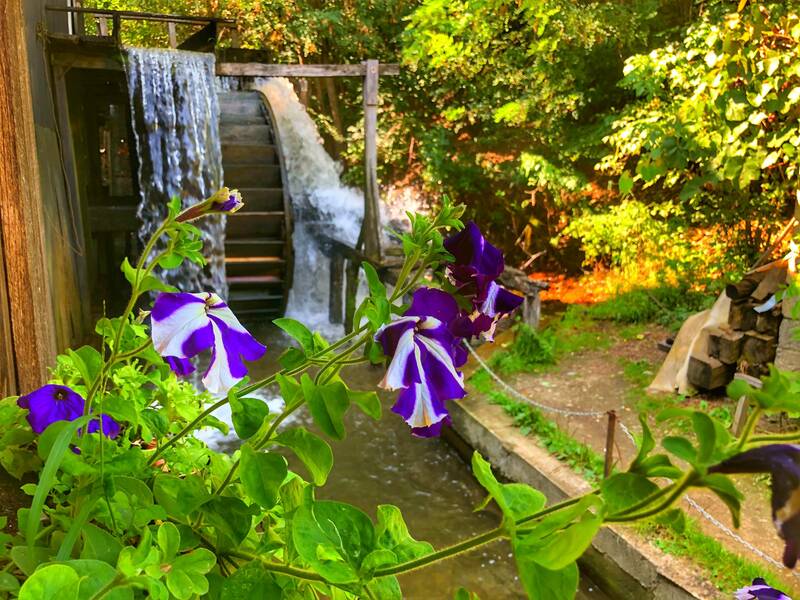 My notes recommended stopping off at a viable watermill which was just off the main road and it was well worth a visit. As well as getting to see the huge stone mill being turned round by the river, the proprietor had set up a little café with cold drinks and I downed a fresh elderflower juice while I admired his wife’s garden, stuffed full with a riot of colourful flowers. Ouch. The day before may have been relatively easy but it was still a slightly painful moment to perch my bottom on the saddle the next morning. It was also the hottest day of my trip and the sun was high and strong by 10am. This was another flattish day of cycling with rolling fields on either side with the Fagaras mountains looming in the distance. Huge storks followed in the wake of the haymakers feasting on the small beasts they uncovered for them. I passed a series of small shrines by the wayside, some under trees and with little benches so that weary travellers could rest and enjoy a moment of reflection. Towards lunch there was an option to visit the Monastery of Brancoveanau. It was a 19km detour but I was feeling good and decided I would go for it. Five kms in, I was regretting that decision. I felt like I was biking through mud. In fact, it was just a very gradual uphill but having been spoilt with all the flat and downhill, it was a struggle. 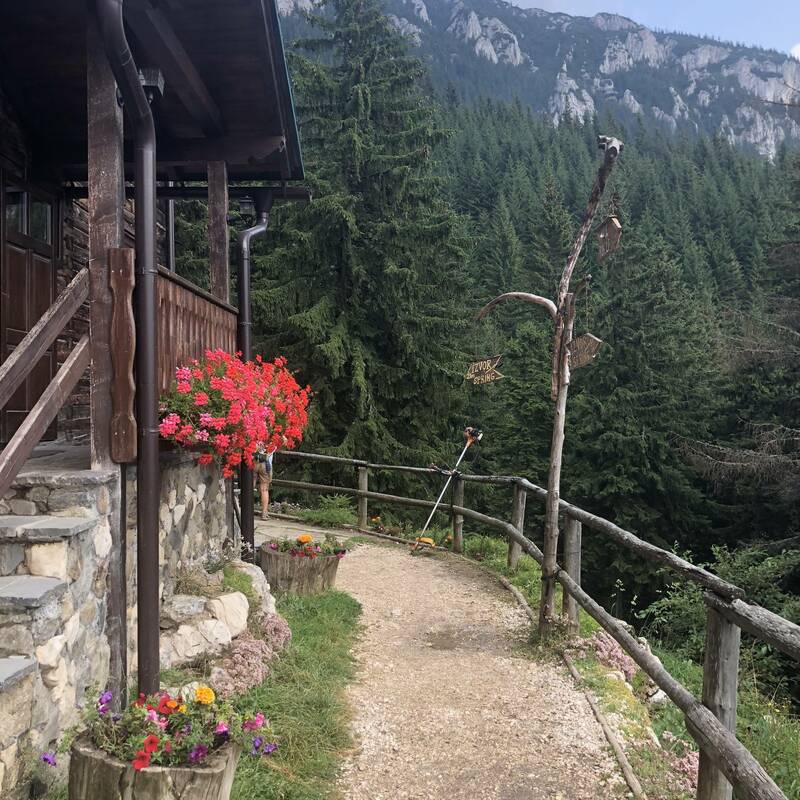 The monastery was set in another glorious garden with the backdrop of the dramatic Fagaras mountains and I decided it was worth a bit of extra exercise – especially since the return was all downhill and a breeze. Lunch that day was in a charming little B&B, Pensiunea Izvorul Sambata, with a big garden full of grape vines and apple trees. The family had laid me out a dish of salami, olives, tomato, a red pepper, aubergine dip, local cheeses, fresh bread and devilled eggs. I tucked in, gulping down the cold water on the table, and then my hostess brought out a dish of hot veal and potatoes followed by apple strudel! 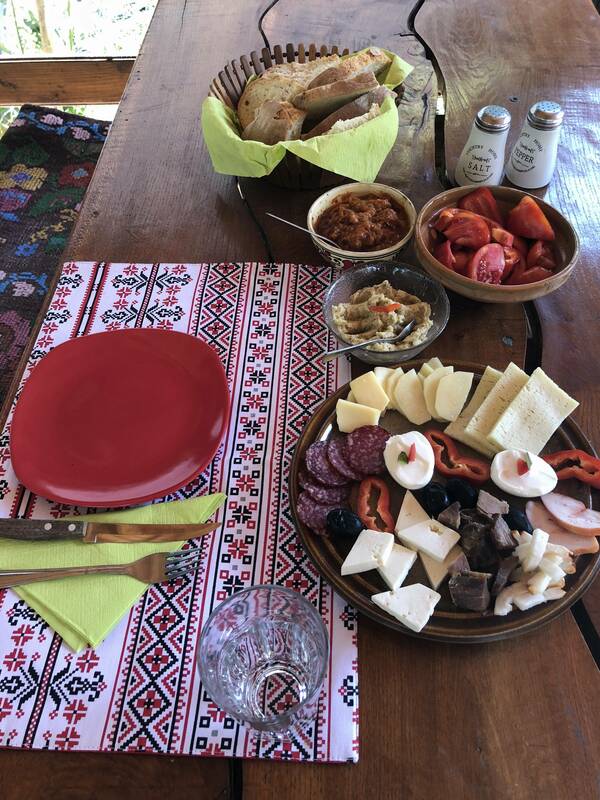 Romanians are extremely hospitable and it would be impossible to go hungry. The meals are all enormous and home-made. Vegetables are grown in the garden and meat is bought from the local farms. The food is hearty and simple: lots of pork and veal with cooked cabbage and potatoes. Cheese is often made at home and in Pensiunea Cojanu in Bran, my landlady brought out her speciality: goat’s cheese wrapped in fir bark for me to taste. My very favourite dish, though, was veal wrapped in cabbage – Sarmale. Four days was not enough and has left me with an appetite to go back to Romania. The hiking and biking were both extremely enjoyable and really well planned. The countryside is absolutely gorgeous and the people are kind and friendly. What’s more they have a tendency to stuff you full of cake at every meal which has to be a bonus. A beautiful country and one that should be on your go-to list.